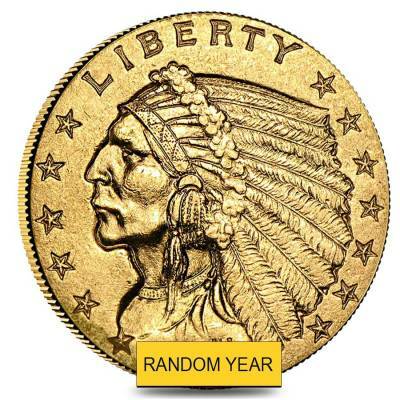 One of the shortest series in the U.S. Coinage history with multiple interesting merits, the $2.5 Gold Quarter Eagle Indian Head has carved itself a niche in the world of precious metal coins. The coin is popular for its unique incused designs that has captivated the numismatists’ undivided attention. 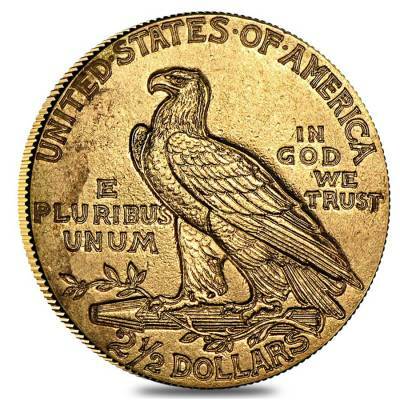 There is just one more coin in the entire American coinage to have a similar incused design and that is the Gold Half Eagle. The Gold Eagle Indian Head coin was minted from 1908 to 1929. The designer of these coins is a sculptor from Boston, Bela Lyon Pratt. The immense artistic merit, the novel minting process, age, rarity, condition all make this coin a numismatist’s and investor’s favorite. Contains .12094 Troy oz of .900 fine gold. Obverse: Displays a leftward facing portrait of realistic-­looking male Native American wearing a headdress in the center. The date, 13 stars, and the motto Liberty form a circle around this central image. Designed by Bela Lyon Pratt. Reverse: Features a majestic bald eagle perched on a bunch of arrows and holding an olive branch in its talon. Inscriptions: "United States of America", "E Pluribus Unum", "In God We Trust" and the denomination “2 1/2 Dollars.” Designed by Bela Lyon Pratt. Minted from 1908­-1929, dates and mint mark will be chosen randomly based on availability. U.S. Mint issue from the following mints: Philadelphia or Denver. Individual coins will come in protective plastic flips. Multiples of 50 will come in plastic tubes. 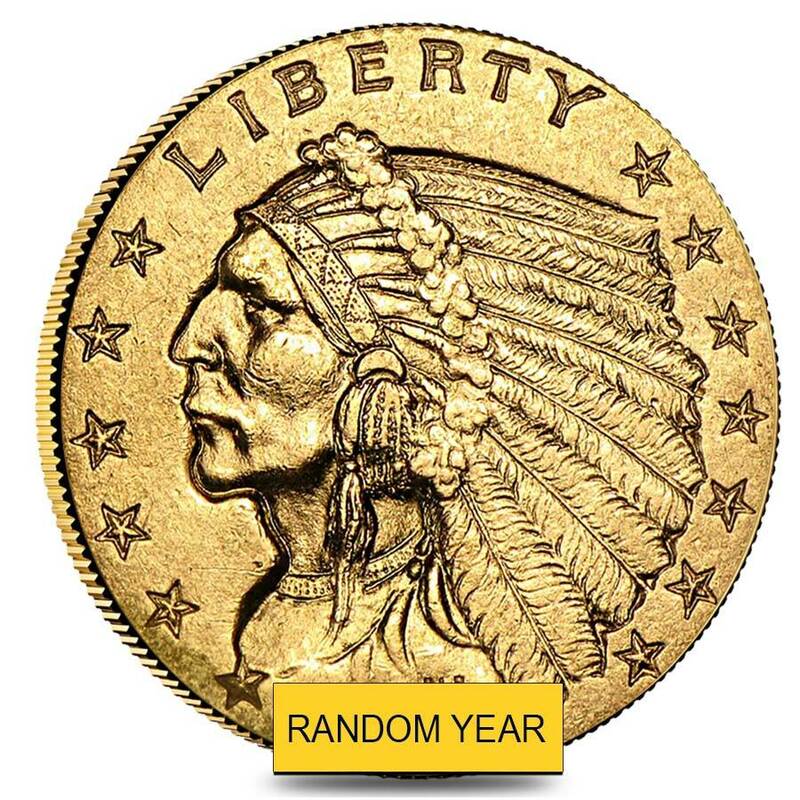 Why Buy Gold Quarter Eagle Indian Head? An impressive price performance track record. The historical significance have elevated the demand for Pre­-1933 gold coins. One of the only two coins to have unique sunken or incused design. One of the smallest series in US coinage history with only 15 different date and mint combinations makes it easier to complete a set. These coins are made from .900 pure gold and have 10% copper alloy, which makes them strong and durable against any wear and damage. Helps diversify your investment portfolio. Great artistic merit, unique sunken relief, and the fact that it is a short series coins makes it a numismatists’ favorite. President Theodore Roosevelt felt an artistic quality was missing in the American coinage of the 19th century. He felt that the boring designs that have hardly seen any change for the past 60 years had to go through a facelift. He put the responsibility of modernizing the American coin designs on the shoulders of his friend and a famous sculptor of the time, Augustus Saint­-Gaudens. He had to give a facelift for four denominations the Double Eagle, Eagle, Half Eagle, and Quarter Eagle. The designs of the Double Eagle and the Eagle opened to rave reviews by the public, and came to be known as the most beautiful coins in the American Coinage History. Unfortunately, before he could complete designing for the remaining two lower denominations, Augustus Saint­-Gaudens lost his life to cancer in August 1907. Dr. William Sturgis Bigelow, physician Boston plays an important role in the designs of the Quarter and Half Eagle that would go down history for their unique minting process. Dr. Bigelow was a close friend of President Theodore Roosevelt, who had been working with a sculptor in Boston, Bela Lyon Pratt to come up with a new coin design which had an incused or sunken relief instead of the normal raised relief coins which had a lot of practical aspects to it like easy stacking, protection of the design, and also would give a high relief design. When he wrote to the President about it, the president expressed his interest in the concept. Pratt at once got to work on the model. He used Saint­-Gaudens’ Gold Eagle Indian Head obverse design which features Lady Liberty wearing a headdress as the base for his work. But instead of a female portrait, he used an unknown male Native American portrait from his collection of photograph for the design. He designed a leftward facing portrait of male Native American wearing a headdress on the obverse side with the date, 13 stars, and the motto “LIBERTY” forming a circle around this central image. The president who was open to new and modern ideas loved the sunken relief design and felt that it was very practical for commerce and gave his approval for minting it. The coins were first minted in 1908, but upon their release the coins stirred criticism. People were unfamiliar with the sunken relief concept, they felt the coin was not good looking. Some felt the coin could not stack well. A particular numismatist from Philadelphia, Samuel Chapman in his letter of criticism to the President wrote that the sunken relief could accumulate dirt and harbor germs which could lead to health issues for the people. But the president’s unshakable faith in the coin made it get a special place in the coinage history of America. This coin is a short lived series and has only 15 different mint and date combinations out of which 12 issues are from Philadelphia and the other 3 are from Denver. The coin was minted from 1908 to 1915 then it was paused for a decade. Again it was issued from 1925 to 1929. Bullion Exchanges is pleased to offer you these $2.5 Gold Quarter Eagle Indian Head ­- Extra Fine XF at one of the most competitive prices in the industry. Feel free to browse our vast collection of Pre­-1933 US Gold coins today to become a proud owner of an inseparable part of American coinage history. Feel free to contact us at 800-­852-­6884 if you have any questions in regards to Pre­-1933 gold coins. Indescribable! You have to buy this to see it in person, it's my absolute favorite! For every $1 spend, you will earn 1 Bullionaire Buck which is equivalent to $0.001 off a future purchase. 262 BB = $0.26.